At Chewy, we know how meaningful your four-legged best friend is to you, therefore we only sell the best in dog supplies, including dog food, dog treats and dog toys. If you've been searching for nylon dog boots & socks, look no further. 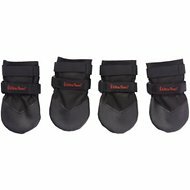 Among the wide selection we carry, one option to try is Ultra Paws Rugged Dog Boots, Black. Key benefit: tough, water resistant 1000 denier nylon material with the top of the toe wrapped in Toughtek�. 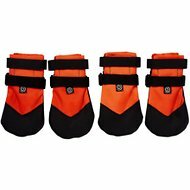 Another product is Ultra Paws Durable Dog Boots. Key benefit: patented design features water-resistant nylon with a high-grip, flexible thermoplastic coating on the toe and sole. From healthy dog food to fun dog toys, Chewy has it all! You'll find everything you need - and if you have any questions be sure to reach out to our customer service available 24 hours a day, seven days a week. For all your pet needs including nylon dog boots & socks, Chewy has you covered! We're here for you.